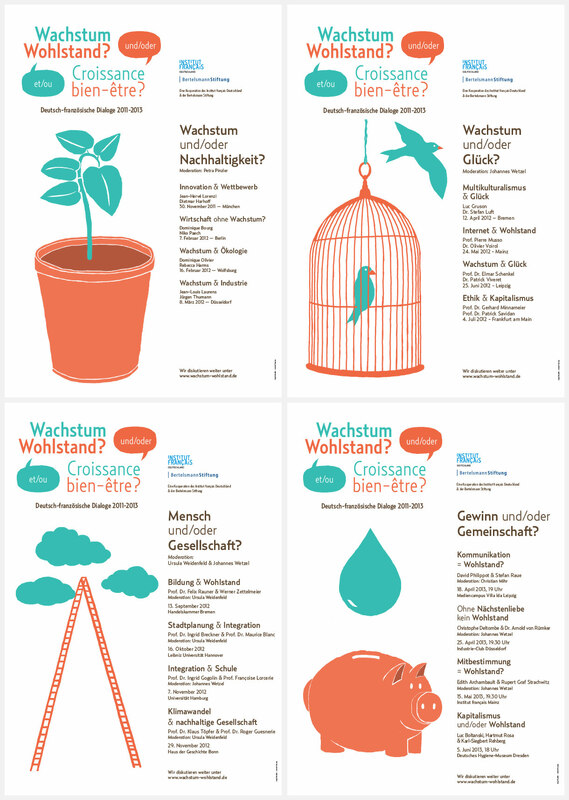 The German-French debate series 2011-2013 titles “Wachstum Und/Oder Wohlstand” (“Growth And/Or Prosperity”) is a collaboration between the Institut Français in Germany and the Bertelsmann Foundation. The aim of this series of events is to discuss important issues relevant to the future growth and to provide German-French and European responses. The theme of “Growth And/Or Prosperity” was defined in terms of the relevance of recent years, in particular the report of the Stiglitz-Sen-Fitoussi Commission provided by the French government in 2009. The heart of the debate is about the strong impact social developments will have on our future life. Growth and / or sustainability? Growth and / or well-being? Human being and / or society? Profit and / or community? The German-French debate series 2014-2015 titles Welches Wachstum für Europa? / Quelle croissance pour l’Europe? is a collaboration between the Institut Français in Germany, The Goethe-Instituts and the Bertelsmann Foundation.